Collaborations increased by approximately 50 percent among scientists who were newly connected by discount air service. The novelty of their projects rose, too. As the internet ushered in an era of low-cost, global communication, many predicted geographic distance would diminish in importance when it came to the circulation of ideas, goods, and services. But for scientific collaboration, face-to-face interactions matter, and the cost of travel remains a key barrier, according to a study by Christian Catalini, Christian Fons-Rosen, and Patrick Gaulé. In How Do Travel Costs Shape Collaboration? (NBER Working Paper No. 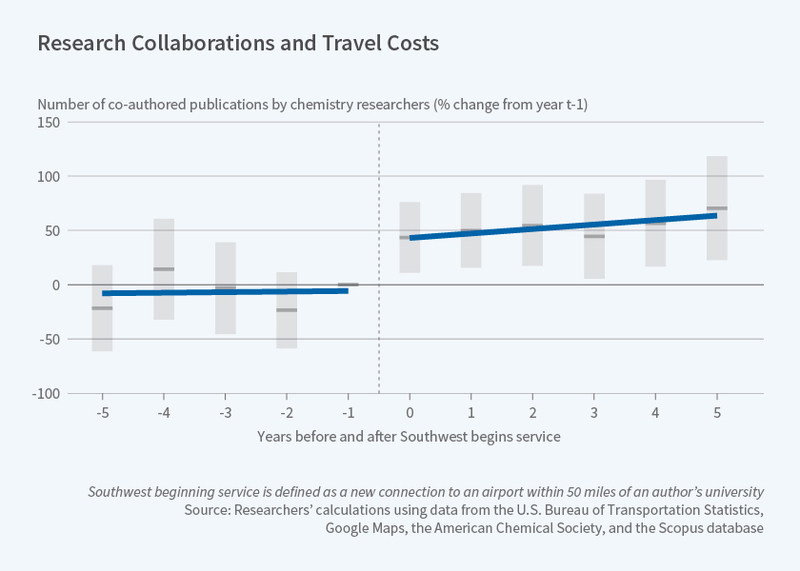 24780), researchers find that the introduction of low-cost airline routes by Southwest Airlines between 1993 and 2012 substantially increased subsequent collaborations between chemists at either end of the new routes. Further, they find that reduction in travel costs was associated with scientists undertaking more novel, exploratory projects that entailed more risk than incremental projects. When choosing collaborators, scientists face a decision-making process that typically involves "a trade-off between less choice locally, and increased communication and travel costs over distance," the researchers write. When projects are incremental and involve mostly established ideas and techniques, the returns to tapping into a global talent pool for collaborators may be relatively limited. For more ambitious or novel projects, however, finding just the right collaborators may be considerably more important, and lower airfares can make accessing best-in-world collaborators more cost-effective. The researchers studied the effects of new Southwest routes that served airports near universities. They matched those routes to pairs of research collaborators — focusing on chemists — and collected data on publications and additional outcomes such as the novelty of the research, its quality, and how equipment-intensive it was. They controlled for other factors that could potentially influence the ability to collaborate, such as a scientists age and the size of departmental research and development budgets. Their final data sample included 758 pairs of scientists, corresponding to 845 individuals, who were studied over an average of 17 years. The results showed an increase in collaboration of approximately 50 percent between researchers who were newly connected by discount air service. The rise in collaboration included both new undertakings between people who had never worked together before and an even stronger effect for existing collaborators. The increase translated to nearly 300 additional copublications per year. The rise in collaboration was often driven by at least one "talented" scientist — the researchers measured talent as having higher productivity than local peers. "[T]he cheaper fares seem to be particularly helpful for individuals that are talented, but potentially do not have access to co-authors of comparable quality within their local environments," the researchers write. Lower travel costs appeared to enable scientists to work more readily with colleagues in different subfields, leading to more cross-disciplinary, risky collaborations. The researchers theorize that these types of collaborations are easier to manage with face-to-face interaction because they may require sharing complex information for which the research partners lack a shared vocabulary or common sets of assumptions. Such challenges may not arise when researchers are from the same subfield. Similarly, they found that the collaborations that seemed to emerge when airfares dropped were more likely to use specialized equipment, which they measured by the frequency of equipment-related keywords in the scientists' publications. The researchers noted that "...at least within chemistry, equipment may play a key role in how scientists select into distant collaborations." The researchers tested their theory using a similar dataset for mathematicians, treating them as a control group of sorts, since collaboration-boosting factors such as specialized lab equipment are less relevant for math. They found a similar effect, but of a lesser magnitude, with a 25 percent increase in copublication versus a 50 percent increase for chemists. As with chemists, the effect was stronger for the more productive mathematicians. They note their findings have implications for the private sector too, such as at firms that have researchers and inventors working across multiple locations.